Israeli Police Push For Prime Minister Netanyahu's Indictment On Corruption Charges : The Two-Way After more than a year of investigations into bribery, fraud and breach-of-trust allegations, officials have recommended that prosecutors pursue the cases. Israeli Prime Minister Benjamin Netanyahu is alleged to have accepted expensive gifts in exchange for favors. In a statement issued Tuesday, police officials said there is sufficient evidence against the prime minister "on suspicions for the offense of fraud and breach of trust regarding his connection" to both wealthy businessmen. However, in the case of Milchan, they've also added bribery. 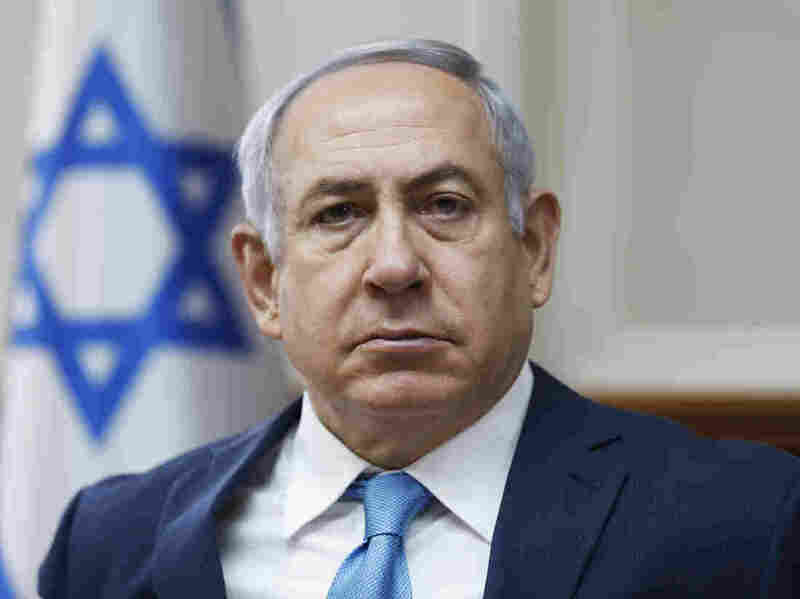 Officials also said they have gathered enough evidence to conclude Netanyahu tried to help an Israeli newspaper publisher with his business in exchange for positive press coverage. And, as NPR's Daniel Estrin reported in August, authorities made a pact with Netanyahu's former chief of staff, who has agreed to become a witness for the state. The announcement by police does not mean Netanyahu will be charged. Ultimately the attorney general decides whether an indictment will be filed, and that could take months. Netanyahu — the longest-serving prime minister since Israel's founding father David Ben-Gurion — denies wrongdoing. He has repeatedly criticized the police investigation as a baseless attempt to bring him down, and Daniel reported the prime minister pleaded his case on Facebook Thursday, writing he has done nothing wrong. Netanyahu also argued that the lead investigator is biased against him but has portrayed the investigations as something that's not about him personally but a left-wing media attempt to topple his right-wing government. In December, the Knesset passed a law sponsored by a member of Netanyahu's party making it harder for police to disclose when they recommend indictments of top officials. Although it has no impact on the current investigation, with the new law it is now up to the attorney general to ask police to submit their findings in criminal investigations against public figures. Critics see the legal measure as an attempt to protect Netanyahu, who could face public pressure to resign in light of the allegations. Police have previously recommended charges be brought against Netanyahu, but there was ultimately no indictment. He vowed Tuesday to remain in office. As quoted by The Associated Press, he said, "I will continue to lead Israel responsibly and faithfully for as long as you, the citizens of Israel choose me to lead you. ... I am certain, I am certain, that the truth will be revealed, and I am certain that at the next elections, which will be held on schedule, I will earn your trust again, with God's help."